ROCHESTER, N.Y. – Semrock, Inc., the leader in quality optical filters for the biotech and analytical instrumentation markets, today announced the addition of new fluorescence filter sets that have been shown in independent tests to as much as double measurement speeds for Fluorescence In Situ Hybridization (FISH). Semrock's latest addition to its acclaimed BrightLine series of "no burn-out" fluorescence filter sets offer superb brightness, minimize crosstalk and are available in the full spectrum of colors. Designed for comfortable visual analysis as well as accuracy in automated, high-throughput measurement systems, BrightLine FISH filters perform faster analyses more conveniently, ensure more accurate diagnoses, and give the user more reliable and repeatable measurements every time, year after year. FISH is rapidly growing into an essential technique for fundamental genetic research, pharmaceutical trial development, and commercial diagnostic testing. Semrock's new FISH filters, like all BrightLine fluorescence filters, are made with sophisticated Ion Beam Sputtering. These BrightLine FISH filters provide far greater measurement brightness and contrast, and are more durable than other filters in use for FISH today, thus making it possible to significantly improve the speed, accuracy, repeatability, and flexibility of FISH analysis and imaging systems. 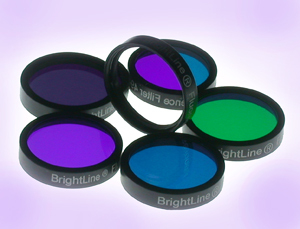 BrightLine filter sets, available with certified sub-pixel image registration, ship rapidly from Semrock's extensive inventory and are available for a wide array of fluorescence applications and budgets for all the major fluorescence microscopes. All BrightLine filter sets are hard-coated for proven "no burn-out" performance. BrightLine filters are covered by U.S. patents issued and pending. Semrock manufactures, in high volume, quality optical filters that set the standard in performance and reliability for the biotech and analytical instrumentation markets. Semrock's patented and patent-pending products include the highly acclaimed BrightLine series of fluorescence filters for research and clinical microscopy, high-throughput screening, real-time PCR, and other fluorescence-based instrumentation; exceptional filters for Raman spectroscopy; and other unique laser analytical instrumentation filters. Semrock's innovative products are made possible by combining modern ion-beam sputtering with Semrock's proprietary volume manufacturing technology. Founded in September 2000, Semrock is based in Rochester, New York, a well-known center of optics, and has sales offices throughout the United States. For additional information about Semrock, its products, and its team of international distributors, visit the company website at www.semrock.com. Semrock and BrightLine are registered trademarks and BrightLine Basic is a trademark of Semrock, Inc.